So, you have a website and a blog, and you’re wondering what social media is all about, and how it might work for your company. Instead of diving in head first into Twitter, you should take a step back, and develop a social model that supports your company’s goals / customer demographics. When thinking strategically about your social eco-system, it will be useful to look at all the components that are available to you, and how they will interrelate. Understanding your eco-system will provide many more opportunities to generate traffic, leads, content and links back to your company. For example, Nielson recently reported that users spend an average of 6.5 hours a month on Social Networking sites. With over 600 million members in the Facebook community alone – your customers are already there. This is a good place to start. On the Social Network side, you have four major communities with differing demographic profiles, and behavior patterns. There are others, such as Plaxo.com, Classmates.com, MySpace.com and Bebo.com that could be of interest to you, but these are the top four. Mobile applications – i.e. over 100 million users a month access Facebook with mobile devices. Desktop applications – i.e. TweetDeck, which integrates content streams from Twitter, Facebook and LinkedIn into one manageable view. Social Network Platform API’s – that allow you to develop applications that aid in greater product sales, and content distribution opportunities. The third part of your eco-system is all those Social Content sites that distribute, and consume user-generated content in very large quantities. There are dozens upon dozens of these user-generated content communities, but these are the most important. Your company website with all the custom landing pages that support interactions with the rest of the social community. Your company Blog, which derives readers from Twitter, then drives them to Facebook fan pages, to content silos, or into the lead conversion funnel. Company applications that consummate selling events, or provide mobile access to products, services and content. Developing a demographic profile, and understand the behavior for each social platform. Develop an eco-system integration roadmap. Name all the parts. Figure out how each social platform works and develop functional expertise in each. Make sure you have engineering resources to evaluate the platforms’ API’s. Make sure you have a project manager / social media manager who own the project. Develop your execution strategy – start simple. To that end, you should start with a single social platform, figure it out, and learn from your successes and mistakes. I suggest that you start with Facebook since it is the largest platform. Once your Facebook presence is well established, you should integrate the next most important platform, which would be Twitter. At this point you need to have a well-developed content and communications strategy to maximize the flow of visitors from Twitter. However, if you are in the B2B business you may want to start with the LinkedIn platform. 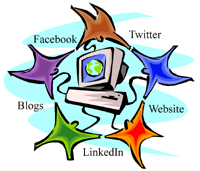 Visit Boston-based Lexington eBusiness Consulting for your social media and SEO needs.